Strange things, these novels of ideas. You read, you read, so charmed and challenged by the intellectual debate that somewhere along the road you completely forget to pay attention to the plot, to the characters and generally to all that makes the essence of a novel. And only in the end you ask yourself if it is a novel what you’ve just read after all. The explanation is of course quite simple: plot and characters are only embodiments of ideas and such writings, while mimicking the narrative structure, with its setup, conflict and resolution, follow subtly in fact either the Hegelian dialectic of thesis-antithesis-synthesis or the essay questioning parts of what-how-why. 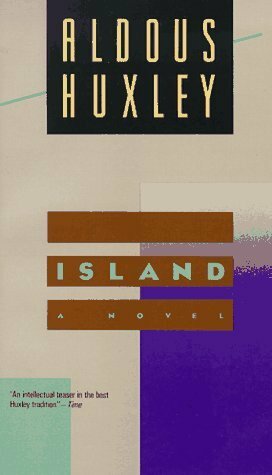 Island, the last Huxley’s book, is the perfect example of such writing. It was seen as the utopian answer to the dystopian Brave New World, but is it? It seems to me both novels develop, in different ways, the same thesis: that mankind cannot stay beauty. Oh, humans may create it, recognize and even admire it for a while, but in the end they always pervert and destroy it. And beauty is not artistic creation, at least not only. Beauty is superior knowledge and constant seek of harmonious relationships – be it in or between people, or between people and nature, or between people and gods. In the name of this coveted harmony was built the World State with its strict regulations and its five casts and its fix-numbered population and its soma to appease any metaphysical anxiety, the perfect, brave new world where happiness was induced artificially from birth and knowledge was forbidden as dangerous. This is civilisation way, Huxley warned then, the Gotterdammerung of mass culture. If you’re a Tantrik, you don’t renounce the world or deny its value; you don’t try to escape into a Nirvana apart from life, as the monks of the Southern School do. No, you accept the world and make use of it; you make use of everything you do, of everything that happens to you, of all the things you see and hear and taste and touch, as so many means to your liberation from the prison of yourself. But of course, such a society cannot compete with the human genius of destruction. Furthermore, it is not allowed to exist (I cannot help thinking this was Huxley’s foreboding of Tibet). The brave new world is waiting just around the corner for the moment to step in and swallow this world and re-create it in its image. Why? First, because it simply isn’t possible for Pala to go on being different from the rest of the world. And second, because it isn’t right that it should be different. What are boys and girls for in America? Answer: for mass consumption. (…) Whereas in Russia there’s a different answer. Boys and girls are for strengthening the national state. (…) And in China it’s the same, but a good deal more so. What are boys and girls for there? For cannon fodder, industry fodder, agriculture fodder, road-building fodder. …I close the book with a sad smile and I realize that I probably forget one day Will Farnaby, and Robert MacPhail and Murugan and the Rani, but I will never forget the utopic society of Pala, which really believed that Shiva-Nataraja would forever dance for them, while stamping on Muyalaka, to free them of the world’s malignity.